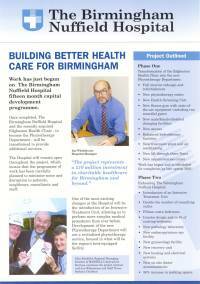 Design, copywrite and print a newsletter for Birmingham Nuffield Hospital to communicate with the local community. Based in the leafy suburbs of Edgbaston, Birmingham, The Birmingham Nuffield Hospital is a charity. The board had agreed a £10m refurbishment programme, involving the main hospital building and the adjacent health & physio club. The duration and nature of the refurbishment contract meant that 50% of the hospital's car parking spaces would be inaccessible, with the likelihood that cars would be parked in neighbouring streets. In addition, the work would result in increased levels of noise. Some residents were also members of the health club and they needed to be informed of the facility's temporary closure. James Manning advised the hospital to instigate a local community relations’ campaign to inform neighbours and keep them on-side. The most effective means was deployment of the agency’s design and public relations’ expertise to produce newsletters for circulation during the project. A number of stories had been produced as part of the hospital's PR media relations’ campaign. These formed the core of the newsletter. 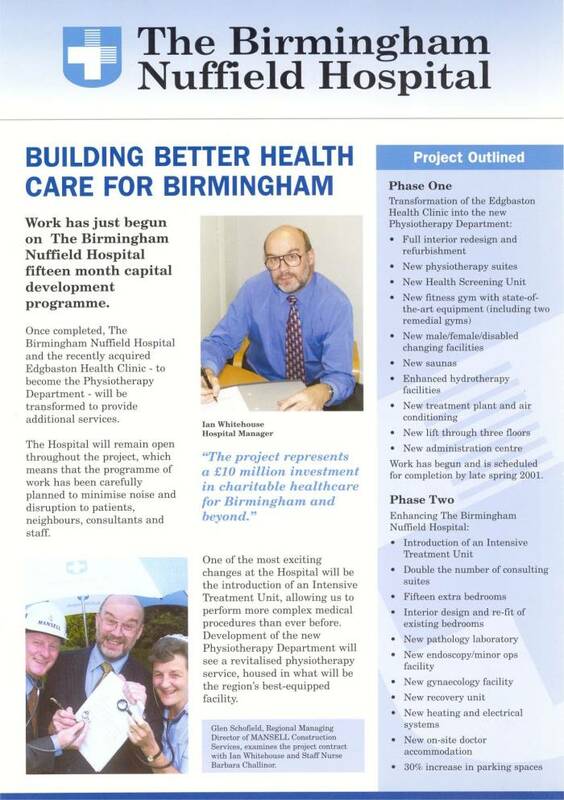 The leader article was a personal address from former RN Submarine Commander, Ian Whitehouse, General Manager of the Birmingham Nuffield Hospital, explaining the reasons for the refurbishment and the benefits to patients, staff and the impact on the neighbourhood. The newsletter was hand-delivered to all neighbours and mailed to existing, former and prospective health club members and GPs who might refer patients. The local community responded positively to being kept informed by newsletters as did health club members. GPs were pleased to be made aware of new equipment and treatments The Birmingham Nuffield Hospital would offer post refurbishment. It also helped to emphasise the Hospital's facilities so that they could be compared with a competitor facility within the region.